Like this user, many people put forth their query regarding MDF file restoration to the SQL Server Database. MDF files are the primary data file that stores all the database items of a SQL Server. Due to some technical issues of SQL database, users often need to restore database from MDF file only. To help users in such situations, we will share some approaches of MDF file attachment to the database. If you have the similar query about MDF file restoration, read the full blog. What is MDF File: The full form of MDF is Master Database File. Of all the files created in SQL Server database, it is the most significant one. It contains all the items of the database. It plays a vital role in the smooth functioning of the database and also used for database restoration in case of any SQL Server issue. If the MDF files get corrupt, it will cause great inconvenience to the users. That is why, SQL users are always advised to have a regular backup of MDF file. Besides, they should always perform best practices to protect MDF files from corruption. How to Restore Database from MDF File Only? If you are facing the need of database restoration from MDF file, you can choose any of the methods from this segment. Go to the list of all applications in your system and click on Microsoft SQL Server. Choose SQL Server Management Studio (SSMS) and a dialog box will appear. Select the correct Server. Also, choose Windows Authentication as the mode of authentication and click on Connect button. SSMS will open and you have to right-click on Databases node. Then click on Attach option from context menu. Attach Database window will open and there, you need to click on Add button. Navigate to the MDF file location, select the MDF file and click on OK.
MDF file will get added in the main windows and you need to click on OK button on this page too. The file will get restored in your database. You can check the database to find out. Note: After MDF file attachment is done, SQL Server will create an LDF file. Use credentials to access SQL Server database engine. Go to New Query Window and run the below script. In case you are not willing to restore database from MDF file only using the manual techniques, you can do that with MDF File Repair Tool. This application will let the users restore MDF file to same database or a different database. The biggest benefit of using this software is its ability to fix corruption issues in case the MDF file is damaged in some way. The application is suitable for SQL Server 2000 and all the above versions including SQL Server 2017. In most cases of corruption and technical issues, users often do not have any other option than to delete the database. After you delete your troubled database, you can also restore database from MDF file only to get back the database as earlier. By following the manual methods mentioned here, users can easily attach their MDF file to the SQL database. For faster and smoother MDF file restoration, users can choose SQL Recovery Tool. The application can perform the database restoration without any data loss and fix MDF file corruption, if any. If you want to know how to find out who deleted records from SQL Server, you may find these queries familiar. Hundreds of users like these are looking for ways to find out the culprit who deleted SQL data that caused them serious problem. If you are one of them, hold on, as we will tell you the most impressive method to locate who deleted SQL Server records. The record of the user who deleted some data from SQL Server can be found in the Transaction Log file. If you want to know, you need to retrieve that information from LDF file of your SQL database. For this, you will require SQL Transaction Log Viewer that can open and read LDF file data easily. 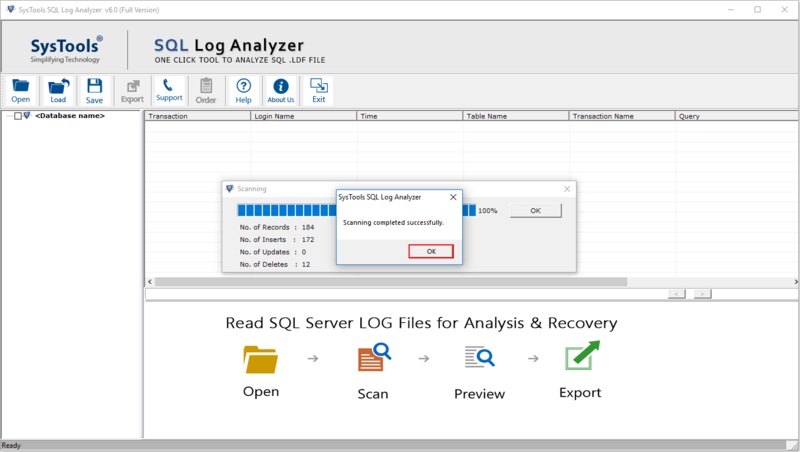 Here is how you can read Log file data using this software. a. 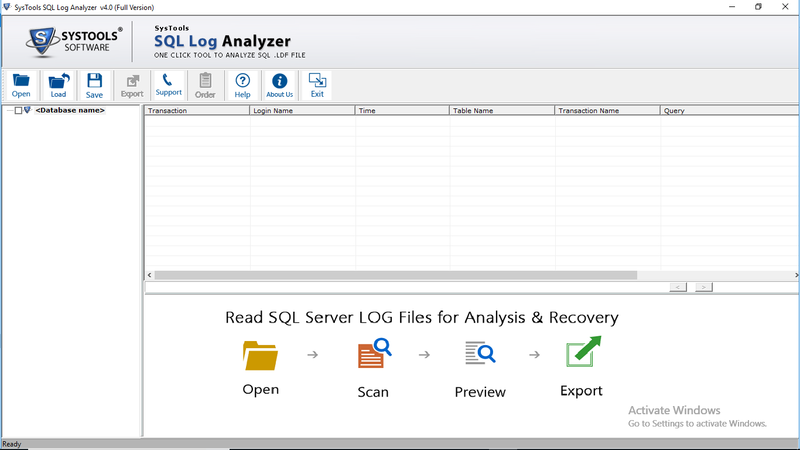 Install and start SQL Log Analyzer Tool of your Windows system. Click on Open to add your log file. b. A dialog box will appear that will showcase two different tabs for Online Database and Offline Database. Here we will show you the procedure of reading Log file form Online database. Select Online DB Options tab and then choose the Server name from the list. Also, select the Authentication mode and Select Database from the list. Click OK when done. c. The software will scan the LDF file and prompt when it is finished. Click OK.
d. It will display the summary of LDF file including counts of records, inserts, updates, and deletes. Again, click OK.
e. Now, you will see the complete LDF file data on the software screen. Any record can be previewed. f. Users can sort the LDF file entries based on Transaction, Login Name, Time, table Name, and Transaction Name. g. Just click on any table entry to select and preview the corresponding log entry of that operation. If you want to know who deleted a record, click on Delete transaction of that record. You will be able to see the Login Name of the person who deleted that data. h. If you wish to export these data, check the boxes beside the necessary tables and click on Export. i. Another dialog box will appear where you can apply record type filter, date filter, Export To/As, Database Credentials for Source database, and Destination Database. j. Click on Export button when all the fields are filled properly. k. The tool will export the selected data and upon finishing, prompt the users. Click OK.
l. The software will also display a report which you can save as CSV file for reference. Note: Besides analyzing Log file data, this software can also retrieve deleted data if the database is in simple recovery mode. SQL database often contains essential information and deletion of such data causes great inconvenience. Hence, we answered the question how to find who deleted records in SQL Server in this post. 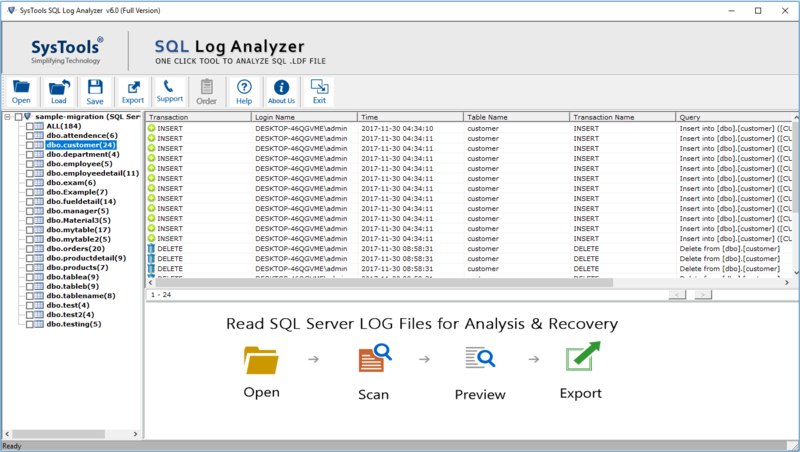 Using SQL Log Analyzer, users can open LDF file and find out who performed any particular transaction like Insert, Update, and Delete. 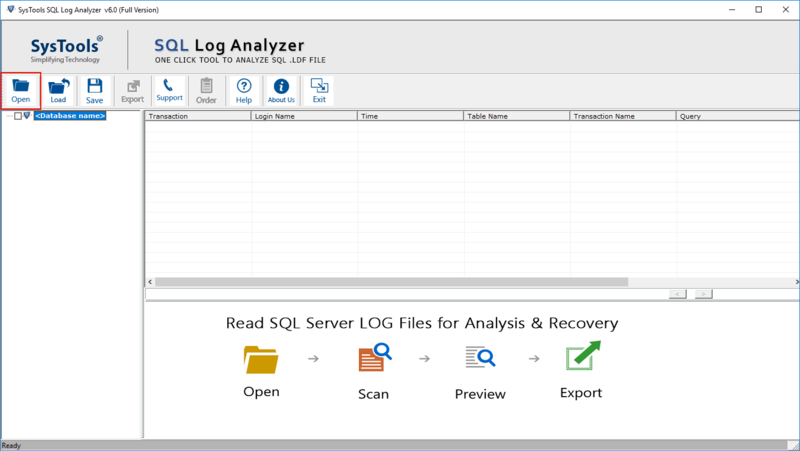 Logs plays an important role in SQL Server Database. Transaction log records all transaction activities done in SQL Server database. After every modification in transaction, a log record is written to the transaction log file. Here we will be discussing on various transaction log myths which various DBAs and users think that they are true. Let us discuss misconception around transaction logs. #Myth1- Transaction Log truncation make the log file smaller. Reality – No, Truncation does not reduce the size of physical log file. At the time of truncation, only the active portion is scanned. Some parts are marked as inactive and they are used as free space to write down new transaction. There is no change done in the size of transaction log as the parts which are inactive remain intact and nothing is removed or deleted. #Myth2- No need to take log backup for disaster recovery, if you are taking full backup daily. Reality – This is wrong! Full backup does not mark log file as reusable. It depends on the amount of data you can afford to loose. If you don’t worry to loose your transaction log data, then you should use Simple recovery model. Regular taking transaction log backup does not allow you to afford lost transaction log data. Reality – This is completely untrue! If your SQL Server is too busy, you should take more frequent backups. If you are not taking regular SQL transaction log backup, the transaction log will become full resulting in growth of transaction logs. Busier the SQL Server, more frequent you should take log backups. Taking regular log backup does not block transaction log, but result in an Auto growth event. #Myth4 – If I perform full backup, I Don’t need to perform log backup for point-in-time restore. Reality- This is one of the common misconception every user is believing. The reason for this myth is RESTORE command used with STOPAT clause. STOPAT clause specifies point in time for RESTORE LOG command. This command works well when it is used with log backups. Hence it can also be used with full database backup, it is clear that transaction log backup are not needed to recover at specific point in time. #Myth5 – Shrinking frees space in SQL transaction log so taking transaction log backup is not necessary. Reality – Shrinking operation is not a good practice. It does not resolve the log size issue. The transaction log will grow again, after performing initial shrinking operation.Auto-growth event must be avoided. You can maintain the size of transaction log by performing regular log backup. Or if you afford data loss, you can set recovery Model as Simple Recovery Model. Want to read Transaction Logs Quickly? You can read transaction log in SQL Server by using SQL Server Transaction log reader. It previews all the log activities like Transaction , Time, table name , query. The software fetch & preview records from Live database and it works both as online and offline SQL database environment. Transaction logs plays crucial role in SQL Server Database. The blog covers misconception around transaction logs in SQL Server. 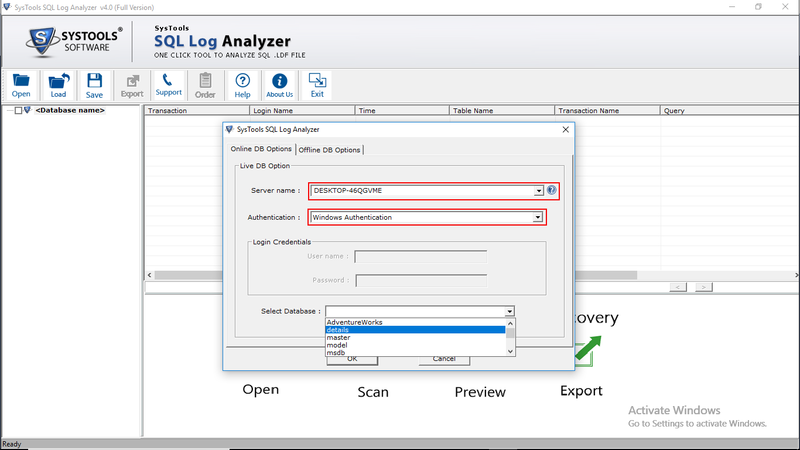 It also discusses a quick way to read transaction log activities in SQL Server. There are many people who got stuck when comes to finding a transaction in a log for a particular user. 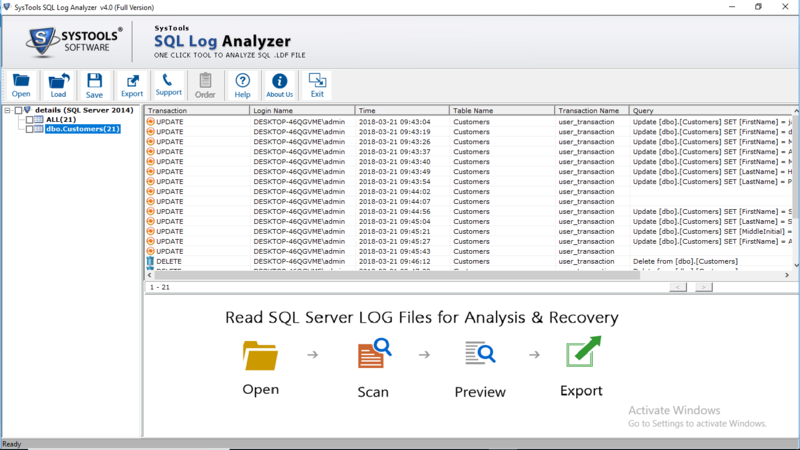 In this case, SQL log file help user to examine all the transaction activity done in the SQL Server. 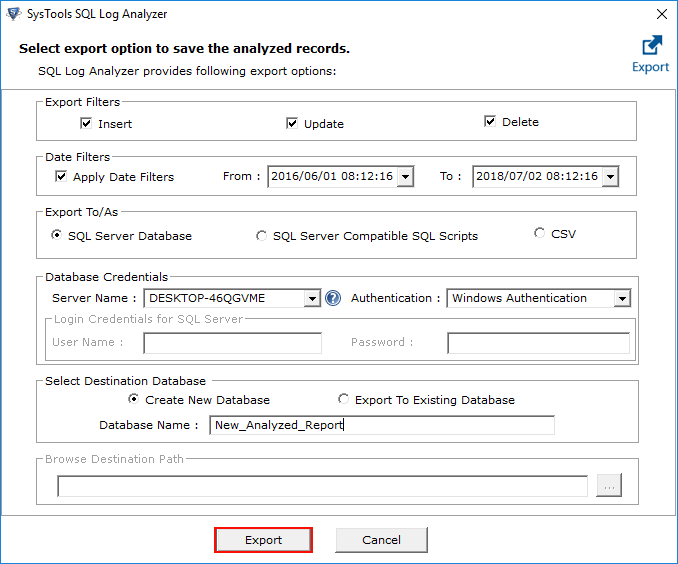 In this blog we will discuss how to find transaction log in SQL Server. SQL Server database consists of transaction log that records all transaction activity like transaction time, transaction name, table name in LDF file. It also records each and every database modifications made by person. So, when a person did any modification in the database, then it becomes easy to identify the person who did changes in a log file. Reading logs in SQL Server is not an easy task, so here we will be discussing an easy & quick way to find out the transaction in SQL Server. Many business decision-makers face problem in connection with database due to many reasons such as sudden system shutdown, delay in troubleshooting, control audits or changes in employees. In such case, sometimes, they need to recover accidentally deleted data, track unwanted changes done in the database and find out the name of the user that has changed the data. 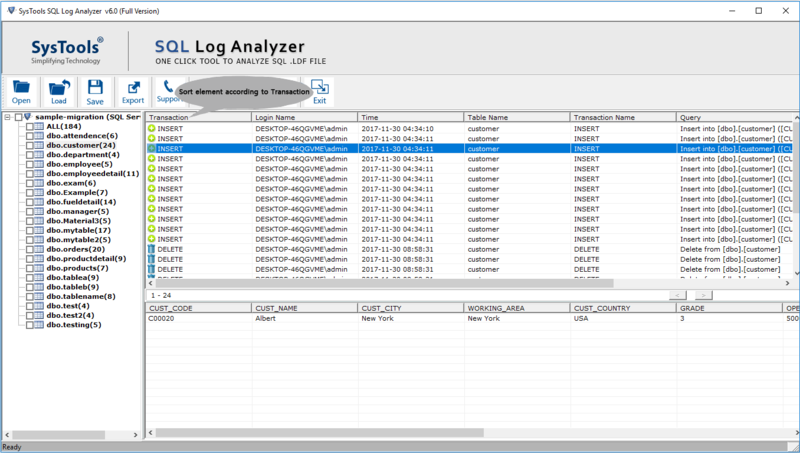 To keep in mind all the things, one easy & quick solution to track down the transaction in SQL Server is by using SQL transaction log reader. It analyze all the transaction details like transaction name, transaction time, table name, query in SQL Server.The tool also offers many advanced features like fetch and view SQL database records from the live database, read & analyze all transactions like insert, delete, update, etc. 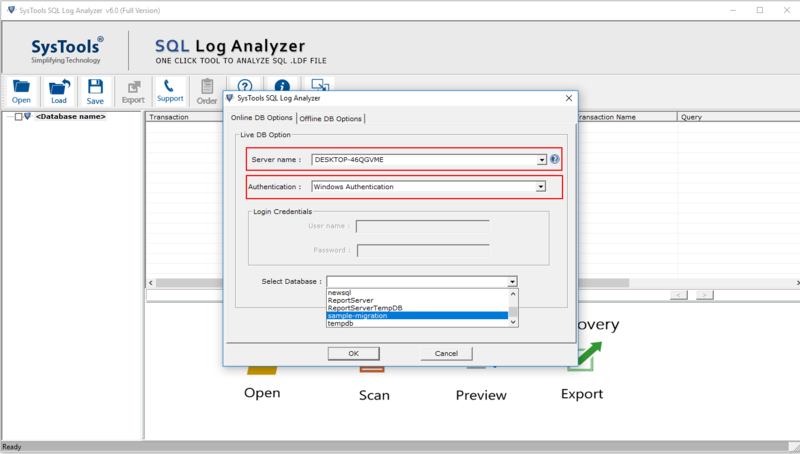 You can easily find out the transaction for a particular user from LDF file with the help of SQL Log Analyzer tool. However, it works in both online and offline environment. 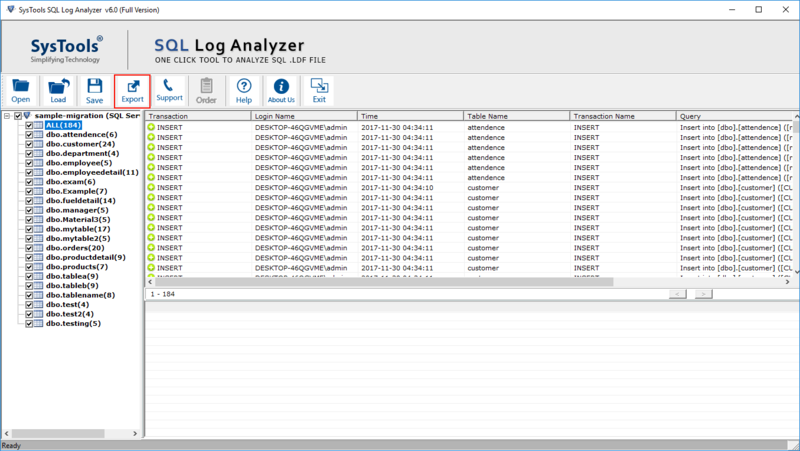 Install & open SQL Log Analyzer tool. Then, click on the Open button to add .ldf file. If you have selected Online database option, then you have to provide all server details. After that, the software will preview all transaction activities. From here, you will get the transaction log for a particular user. In this write up, we have discussed an easy solution on how to read transaction logs in SQL Server. One can analyze and read all the transaction activities done in the logs by using this professional third party utility. Executing a parallelized SELECT (…) INTO Table FROM SourceTable statement, and specifically using the NOLOCK hint, under the default SQL Server lock-based isolation level or higher. In this scenario, other queries that try to access SourceTable will be blocked. While one transaction is holding an exclusive lock on an object (for example, an ongoing table update), another transaction is executing parallelized SELECT (…) FROM SourceTable by using the NOLOCK hint. In this scenario, the SELECT query that is trying to access SourceTable will be blocked. Reference: CU6 for SQL 2014 SP1 (Deprecated) [Link]. Therefore if you have the older build installed (12.0.4449) please update to newer build (12.0.4457). Microsoft SQL Server has been in developer edition as far back as 2005 (if my memory serves me); however each license was $50.00. Now with SQL Server 2014 & 2016, Microsoft has made developer edition free. There is no better time to get on board with SQL Server 2016, there are lots of new functionality and features available. That can help your organization reach new levels of performance, scalability, and data insight. Download and start playing with SQL 2014 here. One of customers changed the value returned from @@SERVERNAME. SQL Server works no problem, however an unexpected behavior appeared. Changing the value for @@SERVERNAME, caused the backups to fail. Looking at the maintenance jobs, found all jobs completed successfully and without issues. However, upon looking at the database’s statics it states no backups completed. Because the database in question is part of AlwaysOn Availability Group (AG); SQL Server executes sys.fn_hadr_backup_is_preferred_replica to determine if the backup should take place on the current node. However, it returns value of 0 for all databases, if the preferred replica is set. Because, the script makes a check that is running on the server that is preferred. It does this by comparing the value to @@SERVERNAME to value of replica_server_name in sys.availability_replicas. Because value will never match, it skips the database on both primary and secondary replica. I have created a Microsoft Connect article (link); asking this little bit of information to be added to Books Online article (link). There was a request submitted by Ola Hallengren (Blog | Twitter), which was closed as Won’t Fix (link). Please vote! Final post in the series, I hope to summarize my findings for everyone. Thanks for all the comments, feedback and comments I have received to-date on these posts. Before providing the summary of all the testing, research and reading, I want to provide some internals for folks. If a server has NUMA configuration, when we define the max memory setting. All memory gets allocated evenly from all NUMA nodes. For example, if I allocate 8GB from a server that has 4 NUMA nodes, it will allocate 2GB from each NUMA node for the instance in question. So be careful, if you are using CPU affinity. As even using CPU affinity, lets say you only want to use NUMA 1 for an instance; this can lead to foreign memory access. NUMA allocation still happens across all NUMA nodes (at least in SQL Server 2014). So even though you might only have subset of schedulers online, memory will still be accessed across all NUMA Nodes. Even though with new hardware foreign memory access does not have major impact on performance. Still recommend avoiding it. If you must use CPU affinity, then allocate sub-set of the processor from each NUMA node. Lazy Writer is back ground process and a thread is created per physical NUMA node (for Soft-NUMA, we only get one thread, you can read details here by Jonathan Kehayias (Blog|Twitter)). Lazy Writer responsibility is to make sure sufficient number of free pages, about 640 pages, are always available for new data to be loaded. If Lazy Writer thread is spinning, that is usually a clear signal of internal memory pressure. Note: Internal Memory pressure does not mean server doesn’t have enough memory. There are multiple factors that can contribute to this, one fact is low Max Server Memory, which is what has been explored in these articles. In this build, I can consistently reproduce the issue. If I set the Max Memory low enough, it caused the Lazy Writer on NUMA node 0 to spin non-stop, as I documented in SQL Server 2012 NUMA Node Imbalance – Cont’d. To further to this I understand some additional internals around this thanks to colleague who helped here. As I was not true sure what is happening. Review the two numbers high-lighted above, Target memory is what this NUMA node is allocated and Current is what is NUMA consuming, therefore the Page Free count is 0. Thus Lazy Writer spinning to free up memory. However it is unable, thus spinning indefinitely causing CPU to pin. Question to answer, why can’t Lazy Writer free up memory from NUMA Node 0? In this, I was just trying to reproduce the issue on my desktop, with no luck. Memory allocation or such were nominal. Again no issue, as per the title of the series, NUMA Imbalance. It was obvious and expected this two scenarios don’t show any issues. But I wanted to confirm it. These test was on same servers as original scenario, however we did not notice any issue. *** During testing, we realized an interesting fact about NUMA configuration in SQL Server 2008 R2. SQL Server swaps NUMA 0 and NUMA 1 CPU mapping when creating a logical mapping for schedulers. For example, if you have 2 NUMA Nodes each with 4 cores; SQL Server binds NUMA 0 – Processor 0 – 3 to Scheduler 4 – 7 and NUMA 1 – Processor 4 – 7 to Scheduler 0 – 3. This is considered NUMA Swap, documented in this MSDN blog article here by CSS Team. However this behavior does not seem to persist in SQL Server 2012. This was interesting case, when I set the Max Server Memory to low value, the NUMA node 0’s processor time started to increase. However it was not as swear as SQL Server 2012, however these are different processors. I had same behavior as noticed above, Current Committed was higher then Target Committed, therefore NUMA thread on Node 0 was spinning. However interesting thing note, it was not as aggressive as SQL Server 2012. It was not continuously spinning, it allowed CPU to breath. However would wake up frequently as low as ever 20ms. !!! Eliminated Locked Pages in Memory as a factor for NUMA Imbalance. Exact same behavior as above was noticed, however, after restart, SQL Server no longer had Current Committed higher then Target Committed. Even after lowering the max memory even further then Scenario #4. It did not cause as dramatic shift. *** Another interesting thing to note in SQL Server 2014. Up-to SQL Server 2012, Lazy Writer Thread bound to CPU 0 of each NUMA Node. In SQL Server 2014, Lazy Writer Thread is binding to last CPU of each NUMA Node. Configuring SQL Server Max Server Memory low memory will cause Lazy Writer to spin due to internal memory pressure issue. There is no value at which point this behavior starts, it depends on the load of the server. For example, in Original Scenario, due to server load under 4000MB it started spinning the Lazy Writer thread; however in Test Scenario #4, I had to go down to as much as 1000MB. Therefore on your servers look at Lazy Writer thread in conjunction with CPU and DBCC MEMORYSTATUS to understand what is truly happening. This behavior is consistent in whether I have Locked Pages in Memory or not. In Windows 2012 R2 NUMA allocation seem to be much better then Windows 2008 R2. SQL Server 2014 Lazy Writer thread does not seem to be as aggressive as SQL Server 2012. Few KB articles came up during my research in SQL Server 2012 that fix NUMA related issues, KB2819662 and KB2926223. There as been some fixes released for NUMA for Windows 2008 R2 operating system also, please review KB2155311 and KB2510206. In addition, if you are running a server with more then 64-logical cores, please review K-Group Configuration, for details please reference this article. Last but not least verify that memory is distributed evenly on physical server. That is the memory banks have been evenly allocated, i.e. you do not have more memory allocated in one bank versus another, as you might also see one NUMA node working extra harder if there is significant amount of foreign memory access. Question to answer, why can’t Lazy Writer free up memory from NUMA Node 0? SQL Server Lazy Writer is only responsible for clearing memory from Buffer Pool, it cannot remove or clear memory from any other memory clerk. Therefore, it is possible, that other internal components have memory allocated on NUMA Node 0 only, therefore NUMA Node 0 is unable to free up enough memory for buffer pool only. Looking at DBCC MEMORYSTATUS we can see which memory clerks allocate from NODE Node 0 only, there are few, for example, MEMORYCLERK_SQLCLR, MEMORYCLERK_SOSMEMMANAGER, OBJECTSTORE_LOCK_MANAGER, and MEMORYCLERK_XE_BUFFER all have allocation from NODE Node 0 only.